Note: Light shooting and different displays may cause the color of the item in the picture a little different from the real thing. The switch has excellent shock absorption and is suitable for a wide range of limit protection applications. : 25T85;Actuator Type : Push Button. Actuator Type : Long Hinge Roller Lever. Mounting Type : Panel Mount. colour:Black Silver. Brand Unbranded MPN Does not apply UPC 190268264563 EAN 190268264563 ISBN Does not apply ISBN 190268264563 EAN Does not apply ISBN Does not apply Designer/Brand Unbranded. 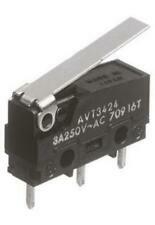 Product Name : Micro Switch;Model No. : 25T85;Actuator Type : Push ButtonWorking Voltage & Current : 15A AC 250V, 4A AC 250VSwitch Body Size(Each) : 3 x1.6 x 1cm/1.1" x 0.6" x 0.4" (L*W*H)Push Button Size : 0.4 x 0.3cm/0.16" x 0.12"(L*H)Package Content : 5 x Micro SwitchNet Weight : 33g;Material : Plastic & Metal;Color : Red, Black, Silver ToneDesigned to control the movement of a mechanical part.High precision mechanism design offering acute operation and long life.The Micro Switch is widely used in appliance, electronic equipment, automatic machine, car electric, etc.In snap action contacts, the movement of the actuator applies force to an overcenter mechanism.This mechanism creates a quick change in contact state when the trip point is reached.Reversing t.